NEW YORK – One year after a white New York police officer shot and killed an 18-year-old black youth, the victim’s friends and family took to the streets of the Bronx, NY over the weekend to protest police bias. 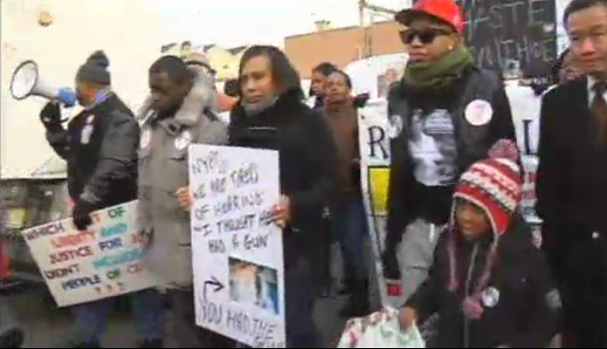 Ramarley Graham was killed from a single shot fired by police officer Richard Haste who followed Graham into his home. The cop was part of a narcotics detail. Haste said he fired his weapon believing Graham was reaching for a gun. He had no weapon. Four months after the incident, Haste was charged with first and second degree manslaughter. He has pled not guilty and is slated to go on trial next month. The demonstrators declared “No justice, No peace” as they marched to the 47th police precinct to hold a candlelight vigil.